Of course, this game is too easy for high school. The strategy is clear to the students, and after that it’s all luck. So after we play with the initial setup, to get the idea of the game, I begin to vary the game board, tailoring it to the level of the class. _^_ + _ _ _ _ is an interesting one – is it best to use a nine, if it is chosen, as the base of the exponent, the exponent itself, or the first digit of the four-digit number? Using fractions reinforces the concept that the bigger the denominator, the smaller the value of the fraction. You can also involve “sin(_ _)” in your expression (specifying that you are using degrees), and students will need to think about what degree value will maximize the sine function. For students thinking about limits, you can compare ratios of different types of functions so that students need to think about the shapes of their graphs and their end behavior. I like this game for several reasons. First of all, there’s an element of suspense when choosing the final few digits that always puts students on the edge of their seats. Almost all students like this game and find it engaging. Secondly, when the game is over (and they are allowed to talk about it), students want to argue about what the best possible result would be. Because of this, they make all the mathematical arguments appropriate to the game board without my having to prompt them. Third, it is extremely malleable to the needs of the class, and it can be anywhere from very easy to very hard. One final note: I’ve been able to find only one web clip of this game, here. They play a simple version in which the object is to make the largest five-digit number possible. Watching it (if you can make it past the super-silly intro) might give you an idea of the principle of the game. This is a post about a problem that never fails. It’s the problem I used for my sample lesson when interviewing for jobs four years ago. It’s the one I almost always use on the first day of class, and it’s also what I give to parents on back to school night. Because… well…it. never. fails. Seriously. 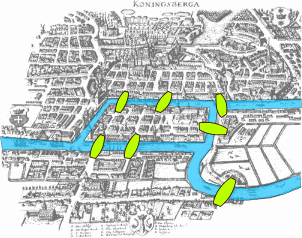 As shown in the image above, the town of Konigsberg once had seven bridges. Back before some of these bridges were bombed during WWII, the residents of the town had a long-standing challenge: to walk through the town in such a way that you crossed each bridge exactly once—i.e., without missing any bridges, and without crossing any of them twice. So, why is this problem so great for a high school classroom? Well, first of all, whenever I tell this rather contrived tale to my students (or their parents, for that matter), they are inevitably scribbling on their scrap paper before I can even finish. It’s a compelling puzzle, simple as that. Voila: in a completely natural fashion, they have reduced the problem just like Euler did. At this point, I usually bring them together for a moment to appreciate what’s going on here: reducing a problem to its essential components, finding the simplest way to represent the underlying structure of the situation. (And I also mention to them that this is precisely the move that Euler made when he invented graph theory based on this initial problem.) Even if they never went any further, this is already a nice lesson in problem solving. Mimi, I am that student. What is the value of log (2/1) + log(3/2) + log(4/3) + … + log(99/98) + log (100/99) ? Students who remembered their logarithm properties (from the last time we had class…) saw almost immediately that they could multiply the arguments together and, ta-da, have the numerator cancel with the denominator until it becomes just log (100) = 2. But there were a few groups who didn’t remember this property. Well, one group knew they could expand the arguments into log 2 – log 1 + log 3 – log 2… but didn’t follow this logic far enough to solve the problem. That would’ve been cool, and it’s exactly why I ask students to share ideas that didn’t work– sometimes it’s a bad idea, other times it’s bad execution. But anyway, I write because one group was kind of sitting and starting at the problem. I heard one of them say, “You know the first one is going to be the biggest, and the others get smaller… and they are getting closer to 0.” And I thought: cool! They just turned this log properties problem into a sequences problem, even looking at what the terms are approaching! I missed this structure of the terms because I had so quickly calculated the answer. I had acted exactly like the students Mimi was talking about in her post (A critical mass problem)– I missed subtlety in my haste to get the answer. It was a little unfortunate that this group couldn’t actually solve the problem with their realization. It’s always fun when a cool insight actually helps you to solve the problem. Maybe next time. Yes, this is math class, but especially in a problems-based curriculum we are teaching reading at the same time, right? Once they put their heads together, kids are able to make nice progress on this problem. It’s intended to teach the habit of “taking things apart” (most kids tend to say, “break it down”), and comes with a suggestion to count the number of triangles you can make within a 2×2 grid, then a 3×2 grid, then the full 3×3 grid. Not all kids take this suggestion (and good for them), but most wind up categorizing triangles by type somehow and then counting how many there are of each type of triangle. Looking back, I think about the little things that tripped up the kids, all of which had to do with implicit assumptions about what the problem was asking. Some kids wanted to know if the vertices of the triangles had to be on the dots in the grid, or if they could be in between. Other kids assumed that the triangles had to be right triangles, or else asked if it was okay to use non-right triangles; these kids thought that there was real ambiguity in the question. I want too much to be helpful, and for the students to be able to get on with their math, so in this case I answered their questions directly rather than doing what (I suppose) I should do: telling them to read the question again. At times I have done a better job guiding students back toward the question. I resolve to be so good again! *this problem appears in our textbook, inspired by a problem on a Math Counts competition.